If Thorn Valley were technically a nation, its national pastime would be food. When the Rats settled into the place, they were having a bit of an identity crisis. For them, cuisine had always meant making do with whatever they could steal. Cooking and the other fine arts were relatively new concepts for them, so as soon as they'd handled their worries about getting enough food, the emphasis switched to wondering what kind. Rats have strong stomachs, judging from the things they usually eat, so it's no surprise that peppers--from jalepeños to habañeros--became a staple. Protein was a problem--dairy products were out, and until the rocky, dangerous routes up to the Plateau were improved, even fish were scarce. The Rats never went in for eating other mammals. But part of the Plan--the plan that an old dreamer named Nicodemus had held dear to his heart from the moment he breathed free air--was to make a living from the land itself. Nutrient-wise, that meant grain. And grain, to any reasonably civilized species, means bread. Early efforts were nearly inedible. Mostly, this was because the problem was approached as a technical one, by an engineer. Arthur (bless his baking-impaired soul) cobbled together the water-power turbines under the Falls, re-founded the Forge, and tapped the nearby geyser which now bore his name--single-handedly saving the whole of Thorn Valley from freezing to death that first terrible winter. But as to his efforts toward bread-making...suffice it to say that everyone was getting really tired of eating oatmeal every morning. 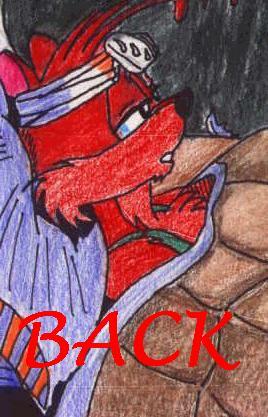 As luck would have it--strange luck indeed--Timothy Brisby took a long walk off a short cliff and broke his back. He didn't adjust well to being wheelchair-bound, even with Tina's loving support, and had far too much time on his paws. Always a voracious reader, he'd read most of Thorn Valley's limited library twice over, and in desperation cracked open an old weather-beaten cookbook. From then on, Timothy could most often be found with his arms elbow-deep in bread dough, and he developed a distinct smell of yeast about him. He tallied his successes and sometimes spectacular failures (including several minor explosions that spattered sourdough across the ceiling) on his miniature computer, and finally baked a tiny loaf of bread which didn't crumble when sliced. In light of this little history, Timothy could be excused for feeling something akin to apprehension as he watched his new houseguests fall upon several larger descendants of that first humble loaf and devour them like a plague of locusts. "This is sinful," groaned Devin. He was living up to his name as a packrat, packing away mass quantities of his hosts' pumpernickel. He slathered yet another slice with an obscene amount of margarine. "Easy on the oleo," Timothy fretted. "We aren't exactly mass-producing it here. Not yet, anyway." "Pardon my asking, Tim," Gadget paused from chowing down on a loaf of her own, "but how do you maneuver around well enough to lay out a spread like this?" It was a fair enough question--the long, low table sagged under the weight of the bread, accompanied by a cheddar-and-wild-onion soufflé, two containers of take-out noodles (very spicy) from The Falls restaurant, and a bowl of walnuts (half already cracked and inhaled by a certain young squirrel). "Well, I can't take credit for the noodles," Timothy started. "Yes, you can. It's your recipe, silly," Tina reminded him. "The noogles are gweat, Dimathee." Timothy cast an uncertain glance at Runner. "Thanks, I think. Can I quote you on that?" "Gadget has a point," Devin nudged the conversation back on course, "I'd think the wheelchair would make cooking a little difficult." Timothy waved them off. "Arthur and I--he's our Chief Engineer, you know--we went over every inch of this place making it wheelchair-accessible. No steps, just ramps. No tight hallways. The big stuff in the kitchen--the oven, the chopping block--it's all down at my level." "They thought of me when they set this place up, too," Tina grinned. "In all the main rooms there's a signal light. Timmy can send me Morse code messages from just about anywhere in the house." Gadget suddenly winced and put her fork back on her plate, soufflé untouched. Devin put a paw on her shoulder. "You okay, Gadge? I know it was a long trip here--"
She shook her head. "I'm not okay, not exactly. Tina, speaking of all the conveniences this place has, they put in plumbing, I hope?" "Sure. Bathroom's the first tunnel on the right. Sort of an indoor outhouse, but--"
"--I'll manage." 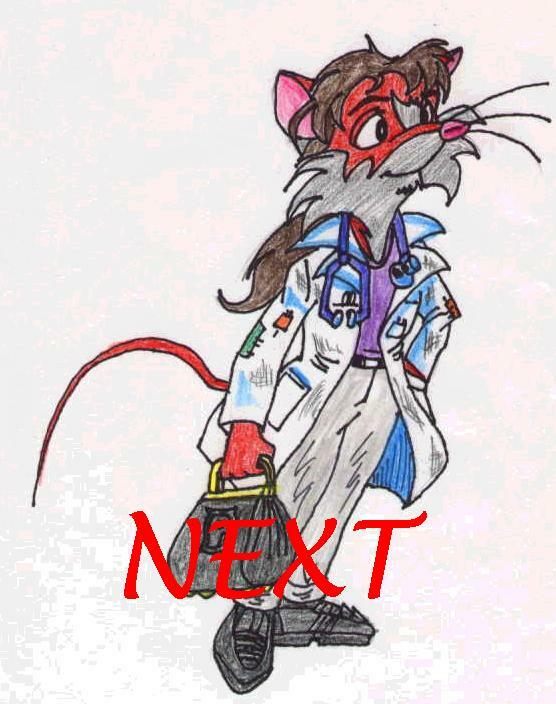 Gadget sprang to her feet and was gone in a flash, paws clenched over her stomach. Timothy whistled in surprise. "She all right, Doc?" Devin scratched his head. "She did have some strange trouble on the way here. You'd think with all the flying machines she's put together she'd be used to the ups and downs, but this time it was hell on her. She said she'd never been airsick before. Maybe it's some bug or other--"
Great, thought Timothy. I bet I'll pick up a good case of whatever it is. He couldn't have been more wrong. "I'll go check on her," Tina volunteered, and zipped off down the side tunnel before the others could thank her. Behind the rough-hewn wooden door, water splashed into the pedestal sink. 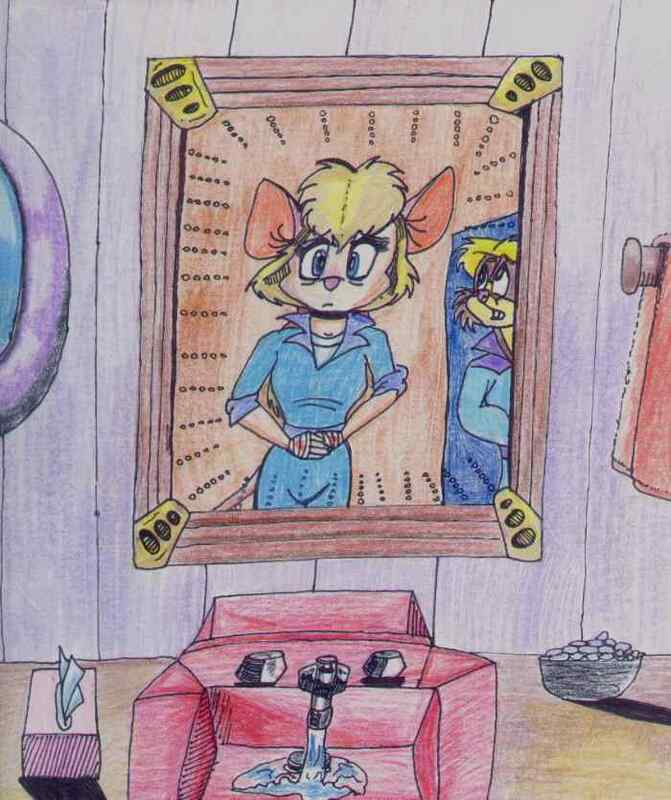 Gadget clung to its sides, an unpleasantly familiar, salty taste in her mouth. She was thankful that albatross travel only came with a light lunch. A voice came through the door, but she barely heard, sizing herself up in the rippled mirror above the sink. A frazzled, travel-worn, and worried mouse looked back at her. I look like hell, she grimaced, her paws sliding down to her troubled stomach. Don't be silly. It wouldn't even show yet. "Gadget? You okay?" came the insistent voice. "Just a sec, Tina," Gadget yelled back. Oh, yeah, she remembered, turned off the water, and turned to open the door. "Jumpy stomach," she said more softly, now that Tina could see her face and read her lips. "Sorry I won't be able to enjoy your welcome dinner. It looks like you went all out." "That's okay. We were just worried about you. We thought you might be coming down with something. We do get a lot of strange germs coming through here, what with the hospital and all--"
Gadget shrugged and chuckled once or twice, though it wasn't funny. "Well, I'm pretty healthy, all things considered. I just have the sneaking suspicion that I'm pregnant."